and pax-to-freighter (“P2F”) programs. Although Alaska Airlines placed a small order with IAI for a -700 P2F to meet a specific operational requirement, Pemco is the first company to publicly announce a -700 conversion program. In contrast, the 737-800 has attracted not less than three companies who are launching P2F programs. Is the 737-700 P2F a “sleeper” whose potential has been overlooked by other competitors? More to the point is the progression of the 737 family of aircraft. 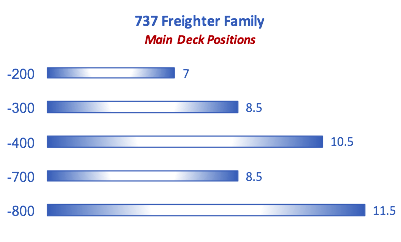 As indicated in the graph below, the 737 variants range from 7 to 11 ½ main deck pallet positions. All 737-200 freighters have been retired so this analysis will focus on the 737 Classics and NGs. 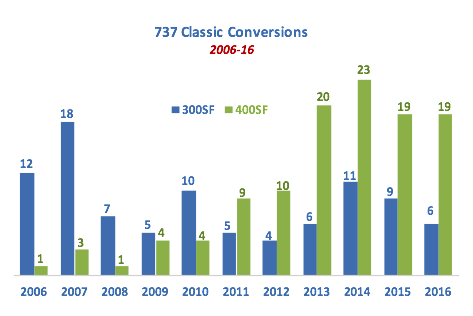 A narrowbody conversion resurgence began in the early 2000s as operators started the process of retiring their aging 727s and 737-200s. Due to dwindling available spares and fuel inefficient engines, these older aircraft had become expensive to maintain. The principal choices at the time were 737 Classics and 757s. Beginning in 2001, DHL introduced into their fleet 34 ex-BA 757s converted by Boeing. However, the popularity of the 757 as a pax aircraft meant high feedstock values which when combined with the high maintenance costs of low utilization cargo operations precluded large scale conversions until a few years later. Additionally, many operators who were replacing 7 to 12 pallet aircraft did not feel compelled to jump to the 757 (14/15 pallets). The 737 Classics became the logical choice for these operators with 737-300 conversions accelerating in 2006. Although many operators had a clear preference for the larger -400, lack of acceptably priced feedstock pushed them to the -300. As the -400 became available in greater numbers and at lower values beginning in 2010, this variant has become the predominant choice outselling the -300 two to one over the last six years. The success of the 737-400SF versus the 737-300SF can only be attributed to its greater cargo capacity since, in all other respects, the aircraft are identical. Given the razor thin margins between profit and loss for a general freight operator, the 20% reduction in unit costs provided by the -400 made the shift to this type inevitable. We are now entering the transition phase from 2nd generation narrowbody freighters (737 Classics and 757s) to the 3rd generation converted freighters represented by 737NGs and the A320/A321 family. Despite initial interest in the A320 as a conversion candidate and higher feedstock values for the A321, focus has now shifted to the A321 with one declared conversion program and another under consideration. Although the A320 has lower feedstock values than the A321, the A320s 10 pallet main deck capacity versus the 13 pallet A321 makes the A320 uncompetitive not only against the A321 and 737-800, but also versus the aircraft it is intended to replace – the 737-400SF. The Boeing conversion market has exhibited a similar pattern, with several 737-800 programs in active development and a belated 737-700 just announced. Despite significantly higher feedstock cost for the 737-800, its additional three main deck pallet positions overwhelm the operating economics of 737-700. In fact, in a relative unit cost performance match-up, the 737 Classics as well as the 737-800 provide superior economics to the 737-700 even when the scales are tipped in favor of the -700 by assuming a -700 feedstock cost of 50% of Fair Market Value (FMV). This would lead one to conclude that, as a “clean sheet” investment, a 737-700 freighter conversion would not be a good opportunity, as it would fail to yield even a modest return on investment. On the other hand, If an operator has fully amortized its 737 and has a market where payload outweighs volume (e.g. auto parts or industrial equipment), an investment in freighter conversion may be warranted. The Pemco press release focuses more on the FlexCombi™, which is probably an indication that they believe that this is the more promising variant. In fact, there are several applications for the combi in the airline, government and commercial markets. While the combi variant could be moderately successful, it is difficult to foresee the same for the full freighter conversion. Fortune Aviation Services provides its clients with timely and accurate guidance to achieve financial goals and profitable investments in commercial aircraft market and related activities. Clients include investment banks, leasing companies, airlines, and MROs.